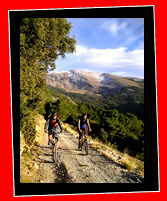 Follow Granada’s principle river for 7kms on a very gentle, well-surfaced slope towards Pinos Genil and Sierra Nevada. This valley floor ride provides the whole family with the chance to escape the city for a few hours while introducing them to one of Granada’s many surrounding villages where great Andalucian food is on offer from riverside bars. Return down the other side of the river on a similarly well-surfaced track arriving back in the centre of Granada. 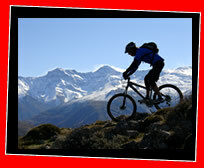 WE CAN ALSO PROVIDE DOWNHILL DAYS FOR THE WHOLE FAMILY - TAKE ADVANTAGE OF OUR TRANSPORT MEANING NO PEDALLING REQUIRED! The last spine of the Sierra, el Llano de la Perdiz, sits right on the edge of Granada with the Alhambra nestling on its lower slopes. This is a half-day ride with various start and end points which will get you above the city and into the favourite biking spot of the local Granadinos. Descend into the cave district of Sacramonte where Flamenco clubs and tapas bars inhabit the hillside and great views of the Alhambra are promised. This ride takes us through some of the most beautiful landscapes in Sierra Nevada with an option on starting points making the climb shorter if requested. Pass Trevenque, known as the King of the Low Mountains and the highest limestone mountain in Sierra Nevada and continue up till we reach Los Poyos de Monachil and a 360 degree view of Granada city, the surrounding sierras and the emblematic Pico de Veleta. Return to the city on the Camino de los Neveros. Granada is surrounded by magnificent mountains and on this route we visit Sierra de Huetor - the smaller sibling of Sierra Nevada. From here, we are treated to the best views of the high sierra and its north face, which is covered in snow much of the year. This ride is rolling through Pine and Holm Oak forests.